A large volume of events in the Kaspersky Security 10.x for Windows Server log file can cause applications and the operating system not to work properly. To optimize storage, we recommend undergoing a log defragmentation using the KAVSHELL VACUUM command. 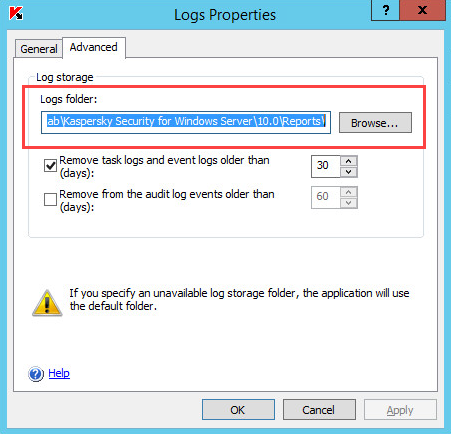 Once you run the command, Kaspersky Security 10.x for Windows Server updates the logical structure of the log files, which are stored by default in: %ALLUSERSPROFILE%\Application Data\Kaspersky Lab\Kaspersky Security for Windows Server\10.0\Reports\. If you have changed the storage path, the KAVSHELL VACUUM command will perform a defragmentation of all files in the folder specified in the Log Properties. Defragmentation limits the working of Kaspersky Security 10.x for Windows Server. Real-time file protection and computer control won’t be performed. There will be no access to the log. The registration of events in the log will be prohibited. We recommend planning ahead of time to execute the KAVSHELL VACUUM outside of work hours. Open the command line (Search -> cmd.exe). The time it takes to perform the KAVSHELL VACUUM increases when defragmenting large files.